HRS Heat Exchangers being used for low temperature evaporation. To reduce the water content of food stuffs and ingredients heat is used to drive moisture from the product. This is often an inefficient method, being extremely energy intensive. However, low temperature evaporation can significantly reduce running costs compared with other drying systems. There are two main methods of reducing the water content of food products and ingredients: drying and evaporation. Materials with a low dry matter have often been dried, while liquids are more frequently evaporated. However, as the food industry develops new and innovative products which are often not truly solid, these traditional divisions are becoming less clear cut. Consequently, many food processors are now combining low temperature evaporation with drying to provide an efficient and energy-saving moisture removal process for a variety of products, not just liquids. There are many reasons for reducing or removing water from food, from shelf life extension and preventing spoilage, to quality preservation or as part of the manufacturing process, such as concentrating or dehydrating products. As a result, a number of different drying systems have been developed, with the main technique being spray drying. Other less common techniques include tunnel drying and drum drying, but all these methods are designed to move air over the product to dry it without damage. Other specialist techniques including freeze drying and vacuum drying may also be employed in certain situations. • The nature of the material, including its physical and chemical composition, moisture content, etc. As well as the energy required, other factors such as preserving product quality or preventing a barrier layer (which will inhibit the drying process) from forming, need to be considered. One thing that most types of drying process used in food production have in common is the use of direct or indirect heat to drive moisture from the product. This is frequently inefficient in terms of energy use, requiring high inputs and taking a relatively long time to achieve the required level of moisture reduction. The Carbon Trust has therefore recommended considering alternatives to conventional process heating, such as, microwave drying (which is expensive and not suitable for many products) or using lower temperature processes, such as evaporation. There is also an increasing overlap between using evaporation and drying techniques, and a combined approach is becoming more common. Drying is extremely energy intensive. However, by using evaporation to reduce the water content of fluid products before they are sent to a spray drier, the overall amount of energy used by the process can be significantly reduced, improving efficiencies and lowering both the cost and environmental impact of the process. In some cases using such a combined technique can double the throughput of an existing spray dryer. 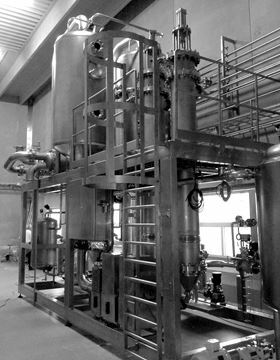 Low temperature evaporation combines the use of a vacuum to reduce the boiling point of the liquid to be removed, together with traditional high temperature evaporators based on heat exchanger technology. Using a vacuum in the system to reduce the boiling point not only reduces the amount of energy required, but can preserve the quality of some products which would be damaged by high temperatures. The type of heat exchanger used will depend on the nature of the products being treated. For materials with low or medium viscosities, such as brines, sugar solutions or evaporated milk, using the HRS K Series as an evaporator module provides high heat transfer rates with good resistance to fouling. For more challenging and viscous materials, such as purees, malt extracts, liquid cheeses and whey protein concentrates, the HRS Unicus Series contains a self-cleaning scraper mechanism which reduces fouling and maintains heat transfer rates (and therefore operational efficiency). While both the K Series and Unicus Series are commonly used in the type of multi-effect evaporation system described above, both heat exchanger models can also be used in other types of evaporator design if required. As can be seen, for non-solid materials with low water content, such as gels, jellies and some emulsions, low temperature evaporation can significantly reduce running costs compared with other drying systems. Where you have a process which requires the removal of water from a food product it may be worth speaking to a heat exchange specialist before you commit to traditional drying methods. HRS Heat Exchangers will showcase their latest ultra-energy efficient digestate pasteurisation technology at UK Ad & Biogas 2015.